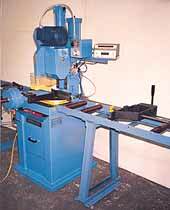 These heavy-duty sawing machines are available for either straight or mitre cuts. A gripper type feed accurately and reliably advances the material. A vertical hold-down, over-reaching horizontal clamping, and full hydraulic control help assure length accuracies of ±.004". Four models are available with capacities ranging up to 6-1/2" round. Both steel cutting and non-ferrous versions are available. 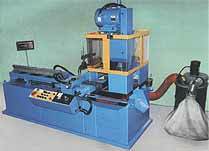 Semi-automatic and manual models are included in this program. By using the high efficiency of hardened and ground spur gearing instead of the more conventional worm gearing, greater power is available. The use of helical spur gearing also reduces vibration and chatter encountered in interrupted cutting thereby reducing the possibility of blade breakage. The saw blade is positioned in line with the center of the column so that all forces are equally distributed and absorbed by the heavy column. This centric location of the blade eliminates twisting and lateral torsion found on competitive models.